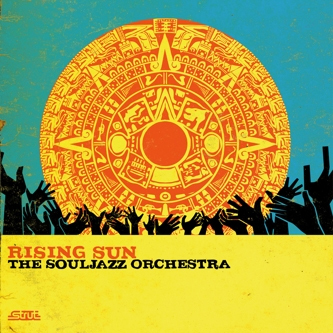 Presumably entirely unrelated to the Soul Jazz label itself, Ottawa, Canada's Souljazz Orchestra have been functional since 2002, drawing on vintage funk, soul and jazz with a welcome Afro-Cuban influence creeping into the mix along the way. Rising Sun is the group's third album and their first for Strut, channelling the percussion-rich rhythms of Ethiopian music and the fluid musicianship of spiritual jazz. Highlights arrive with the soulful languor of 'Serenity', which proves almost hypnotic in its laidback swing, taking on modal main themes that recall Salah Ragab's Egyptian harmonies in its latter stages, while 'Mamaya' slips into an explicitly African-influenced 12/8 time signature. Perhaps best of all is 'Rejoice', a Pharoah Sanders cover spread over two parts that closes the album: the first phase is characterised by freetime, droning loveliness, all coming together in time for an energised second part that's pinned together by hopeful, uptempo grooves and jubilant horn motifs.